The New Testament is a collection of writings which make use of, not just one, but somewhere around twenty words to communicate to its readers the nature of a community of Christians (disciples, Christians, the body of Christ, brothers, holy ones, God’s people, etc.). 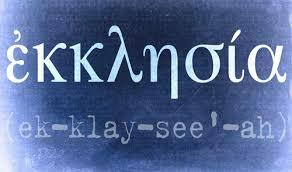 Out of these twenty words, today’s religious people have chosen for almost exclusive use the one word, ekklesia. The first-century definition of ekklesia was stated in the New Testament itself very soon in the story of the spread of Christianity. In Acts 19, Paul came to Ephesus to teach people about Christ. Those who opposed that activity brought to the Ephesian amphitheater what is called in verse 32 and verse 40 an ekklesia. This word is translated by both the King James Version and the American Standard Version as “assembly”! The town clerk of Ephesus, in attempting to calm this situation, told this “assembly” of people in verse 39 that if they had any grievances, they should take these to the ekklesia, which word the King James Version and the American Standard Version again translated “assembly,” and by which word the town clerk was referring to the group of leading citizens in Ephesus who held regular meetings for the purpose of conducting city business and deciding city affairs. “Upon this bedrock I will build up my assembly” (Matthew 16:18). ” Now on that day a severe persecution started against the assembly in Jerusalem” (Acts 8:1). ” Saul was trying to destroy the assembly, entering into the houses” (Acts 8:3). ” The assembly in the whole of Judea and Galilee and Samaria had peace, being built up” (Acts 9:31). ” Now it happened that even for a whole year they came together with the assembly and taught a considerable throng” (Acts 11:26). ” Shepherd the assembly of the Lord which He acquired for Himself through His own blood” (Acts 20:28). ” Greet Prisca and Aquilla . . . and the group that is in their house” (Romans 16:3,5). ” All the assemblies of Christ greet you” (Romans 16:16). ” As in all the assemblies of the holy ones, let the women be silent in the assemblies” (1 Corinthians 14:33,34). ” He is the head of the body, the assembly” (Colossians 1:18). The English language was first spoken on this planet as a Germanic dialect, known as Old English or Anglo-Saxon, which began to be spoken in northern England some years after the Anglo-Saxon conquest of that island starting in 449 AD. The earliest written Old English, however, did not appear until approximately 800 AD. If we allow 50 years for the conquest to have its effect on England’s native dwellers, that means sometime around 500 AD, the people in northern England started referring to a building erected for worship as a cirice, later, chirche, and finally, a church. It is extremely difficult to understand how this word which was not spoken anywhere on earth until 400 years after the New Testament was written and cannot be shown by a single citation to have been a word known to first-century people—how this word could be the definition of a first-century word, yet, that is what thousands of people today believe and teach! Asserting that “church” is not a building, we have teachers who continue to use the word “church,” which designated the buildings of the people of northern England! Conclusion: Those who teach the word “assembly, group, gathering” are honoring the Scripture’s voice and silence; those who teach the word “church” are rejecting the Scripture’s voice and silence and honoring in its place the voice of the 6th century people of northern England! (1) While the King James Version makes useof the word “church,” the New Testament as written in the first century, uses that word nowhere at all on any one of its pages! (2) Anyone who consults an English dictionary will see that the word “church” has several definitions, all of them different. That means the word is totally inadequate for expressing the nature or essence of a group of Christians who are functioning according to the first-century-pattern of teaching and worship. (3) Since there are somewhere around twenty words used by Scripture, God must have thereby intended to emphasize the many-faceted nature of a community of Christians instead of restricting that nature by the use of one word; and wouldn’t it be logical to expect that those who are concerned about God’s way of doing things would adopt the same usage? (This article by Don Reb first appeared in Firm Foundation, June 3, 1980). We believe that the foregoing article has an important message that should be thoughtfully considered by those who wish to develop proper Scriptural concepts. 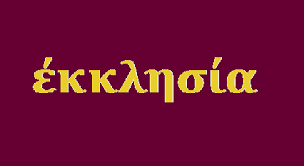 One questionable part of the article, however, is its failure to recognize that many Bible students hold that the word ekklesia is not to be interpreted primarily in terms of its secular and political use by the Greeks. Rather, it is to be seen in light of the LXX or Septuagint (the Greek translation of the OT which was widely used by Jews in the Greco-Roman world), where it referred to Israel, the people of God. 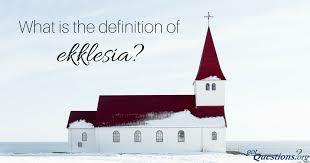 Just as the people of God in OT times were called the ekklesia, so the people of God in the first-century (the Christians) were called the ekklesia, or the community, of God. ” My community” (Matt. 16:18). ” The assembly of God” (1 Cor. 1:2). ” The company of the living God” (1 Tim. 3:15). ” The congregations of Christ” (Rom. 16:16). ” The assemblies of the saints” (1 Cor. 14:33). ” The community of the first-born” (Heb. 12:23). “the household of the faith” (Gal. 6:10). ” the household of God” (1 Tim. 3:15; Eph. 2:19). ” Christ’s body” (1 Cor. 12:27). ” the body of Christ” (Eph. 4:12). ” a temple of God” (1 Cor. 3:16). ” the temple of the living God” (2 Cor. 6:16). ” a holy temple in the Lord” (Eph. 2:21). ” a spiritual house” (1 Pet. 2:5). ” the people of God” (Heb. 4:9; 1 Pet. 2:10). ” the brotherhood” (1 Pet. 2:17). In each case, the term was not mean to be exclusive or sectarian, but simply descriptive of a relationship or position that believers enjoy. Nor were the terms given to officially denominate (give a proper name to) the people of God. The Lord’s body has no exclusive title as religious organizations do. Our Lord’s community is not “denominational” in nature! Let others use “church” or any other term they wish. Let the “Lutheran Church,” the “Catholic Church,” the “Methodist Church,” the “Presbyterian Church,” and the “Pentecostal Church” use the term. Let the “Baptist Churches” and others employ it. But let us seek to be as Scriptural as possible and convey truth even in what we call ourselves! Notice also the article, “Christians Only,” on this Website!